This Puente Romano guide forms part of the Realista guides to iconic places on the Costa del Sol. Below you’ll find a general overview of this emblematic hotel and the amenities onsite. This guide also provides information about property available within the hotel site, as well as in the adjacent Marina Puente Romano complex. Puente Romano Hotel was built in 1974 on the back of the huge success of its neighbour, the Marbella Club Hotel. Named after the first century Roman bridge on the site, Puente Romano Hotel started life as apartments before becoming a hotel in 1979. 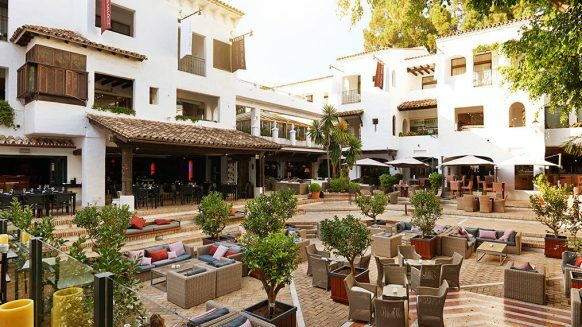 Like Marbella Club Hotel, the hotel enjoys a privileged position in the heart of the Golden Mile in Marbella and ranks as one of the best 5-star GL hotels on the Costa del Sol. Puente Romano Hotel offers luxury accommodation including several suites – the Imperial Suite with sea views and 190 square metres is famed as one of the most exclusive hotel suites in Spain. The hotel boasts award-winning tropical gardens with over 400 plant and tree species as well as numerous water features. Other onsite facilities including a well-being centre and spa, several restaurants and a beach club. 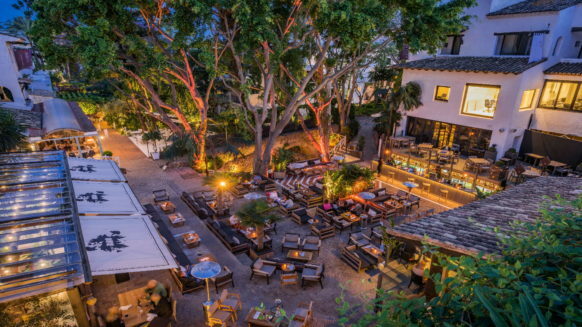 The Puente Romano beach club comes into its own in the summer months with a restaurant, bar and live music every evening. A member of the Leading Hotels of the World since 1982, Puente Romano Hotel also has one of the best tennis clubs in Spain. Synonymous with top players, the club opened in 1980 under the management of Bjorn Borg who got married at the Hotel. Wimbledon champion Manolo Santana took over the Puente Romano Tennis Club in 1983. The club boasts ten tennis courts, eight of which are clay and four paddle tennis courts plus a gymnasium and shop. The central court has a capacity for 2,500 spectators and the Club regularly hosts tournaments in which big-name players participate. Spain won the qualifying round for the Davis Cup against Mexico here in 1988. Since then, most of the world’s best tennis players have visited the installations. The Club’s central court also holds concerts in the summer. Spanish soprano Montserrat Caballé sang at the opening concert in 1992 and since then, some of the world’s top artists have performed here: Lionel Richie, Dionne Warwick, Bryan Ferry and Van Morrison, to name just a few. The summer programmes in 2017 and 2018 included George Bensen, Foreigner and Kool & The Gang. Puente Romano Hotel is also home to Michelin-starred chef Dani García who has two restaurants on the premises: Dani García Restaurant and Bibo. Dani García Restaurant ranks as one of the best places to eat in Marbella, if not the Costa del Sol, and serves tasting menus and dishes from the à la carte menu, based around García’s innovative cuisine. Bibo has a more informal vibe and serves bistro-type food. Located in Puente Romano Beach Resort, it will introduce Nobu’s world-renowned cuisine at the heart of Marbella’s dining scene. you will also be able to taste specialty plates inspired by Marbella itself. Puente Romano Hotel enjoys an ideal position in Marbella. Set on some of the best beaches in Marbella, the hotel is within minutes for both the centre of Marbella and Puerto Banús. Several world-class golf courses lie on its doorstep. 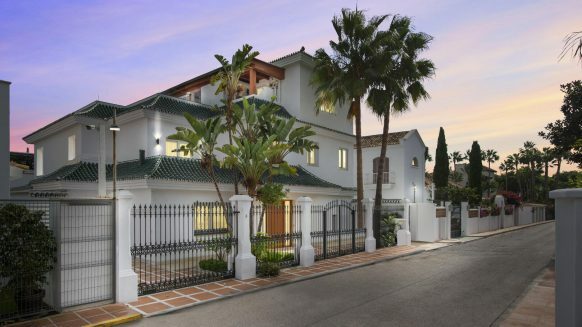 To allow non-guests to make the most of this unique situation, Puente Romano Hotel also offers property options, such as this fantastic apartment for sale in Puente Romano. The adjacent Marina Puente Romano complex includes apartments whose penthouses rank among some of the most luxurious properties on the Costa del Sol. The complex is set in exquisite gardens themed as Persian, Japanese and Andalusian, and enjoys absolute tranquility as well as panoramic views of the Mediterranean and the Sierra Blanca mountain range.